The Colorado Trail (CT) is a 483 mile long trail running from the mouth of Waterton Canyon southwest of Denver to Durango in Colorado, United States. The CT traverses Colorado's mountains. Its highest point is 13,334 feet above sea level, and most of the trail is above 10,000 feet. Despite its high elevation, the trail often dips below the alpine timberline to provide a measure of safety in the exposed, storm-prone regions above tree line. The Colorado Trail is an established, marked, and (mostly) non-motorized trail open to hikers, horse riders, and bicyclists (aka mountain bikers, which are prohibited on the sections which pass through designated wilderness areas). From the eastern terminus, southwest of Denver, the trail winds its way for 483 miles through the state's most mountainous regions, to its final conclusion, a few miles north of Durango. Along the way, it passes through eight major mountain ranges, seven national forests, and six wilderness areas. Trail elevations range from a low of about 5,500 feet at the Denver end of the trail to a high of 13,334 feet on Coney Summit in the San Juan Mountains. The trail rises and falls dramatically. Some estimate that those hardy souls hiking the entire length of the trail will gain (and lose) nearly 75,000 vertical feet. The trail passes through what is considered to be some of the state's most beautiful country. Wildlife abounds and wildflowers, in season, are abundant. While much of the trail passes through forests, a good portion of it reaches above timberline, where trees are unable to grow and views are breathtaking. The trail passes through historic mining towns, along ancient Indian trails, and through a modern, world-class ski resort. Other sections appear much as they would have 500 years ago. The western half of the Colorado Trail, between Monarch Pass and Durango, is generally considered more beautiful than the portion from Denver to Monarch Pass. The western part of the trail has less human influence, greater vistas and a display of spectacular wildflowers. Although this trail is never officially closed to hikers, in practice large parts of it are prohibitively difficult in the winter because of deep snow. The practical season for the Colorado Trail is roughly June through early October. The majority of "thru-hikers" (those who hike the trail in one segment) hike from east to west. This choice of direction is preferred mainly because snow melts earlier in the year on the eastern portion of the trail than on the higher western portion. In addition, the east-to-west hike allows a thru-hiker to start with smaller elevation gains and build up to the more rugged terrain of the western portion of the trail in the San Juan Mountains. The time required for a Thru-Hiker to complete the Colorado Trail varies greatly. While some (supported) trail runners manage to finish it in less than 10 days, most Thru-Hikers spend about 40 days on the trail. 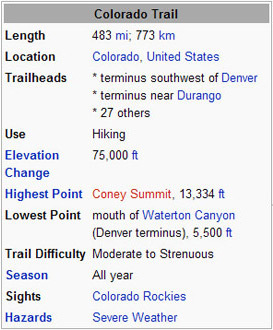 The Colorado Trail was completed in 1987. The trail was built by and is currently maintained by the non-profit Colorado Trail Foundation and the United States Forest Service. The Colorado Trail and the Continental Divide Trail follow the same path for approximately 200 miles.